This is an update to my Cosmix post from a few years ago. At that point I only had a few of these figures and now I have a bunch more, so I thought it was time to take some new photos and revisit these little French weirdos! 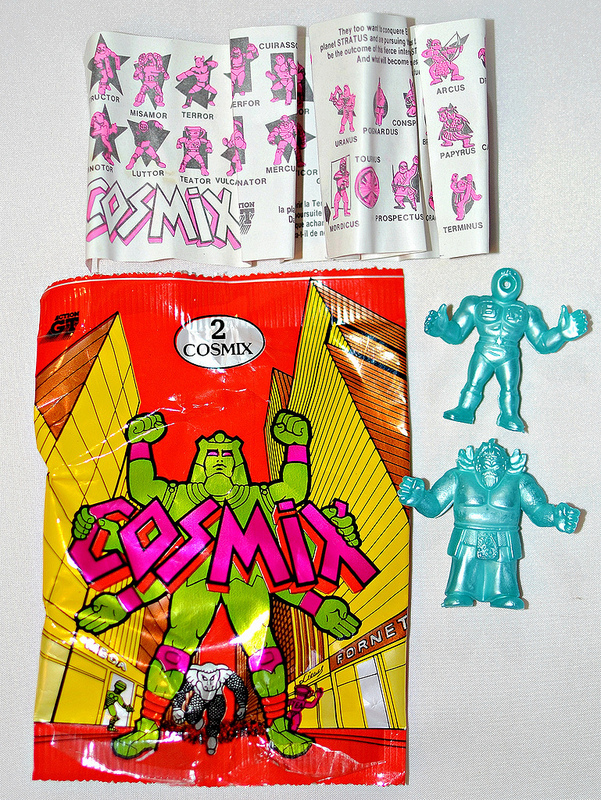 Cosmix were sold in France via El Greco and Action GT around the late '1980s / early '1990s. 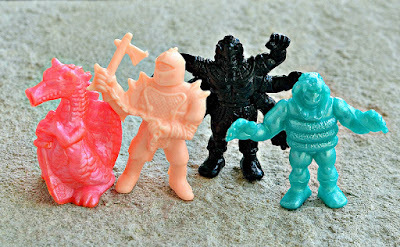 The series used sculpts from an Italian line called Exogini, which used sculpts from two North American toy lines that were released a few years earlier -- MUSCLE from Mattel and NINJA Mites from Panosh. 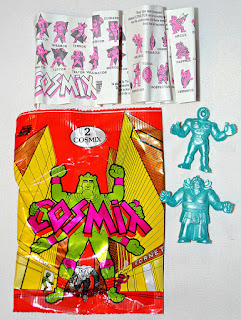 And since MUSCLE used sculpts from Japanese Kinnikuman keshi, some of the Cosmix figures were copies of copies of copies (those MUSCLE / Kinnikuman sculpts really got around back in the day). There are two different series of Cosmix, with Series 1 using MUSCLE sculpts and Series 2 using NINJA Mites. 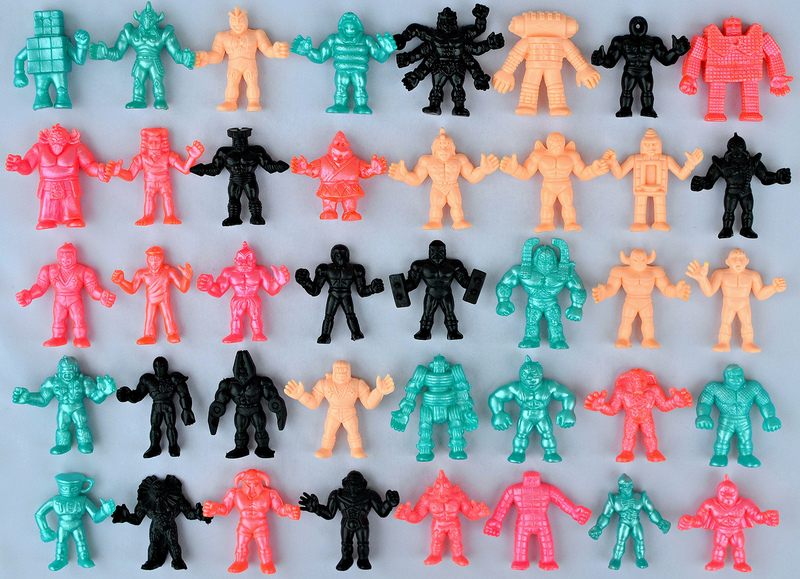 Each contain 40 unique sculpts, so a full set of Cosmix consists of 80 different characters. There are four standard figure colors in each series -- metallic blue-green, metallic pink, light peach and black. Each sculpt came in all four colors. I've heard that other rarer colors (such as translucents) might have been available, but I haven't been able to confirm this. In any case, it's safe to say that Cosmix were made in fewer colors than their Italian Exogini counterparts. The figures came in blind/secret packs, with two figures to a pack. You might notice that the pamphlet shows 88 characters instead of 80. 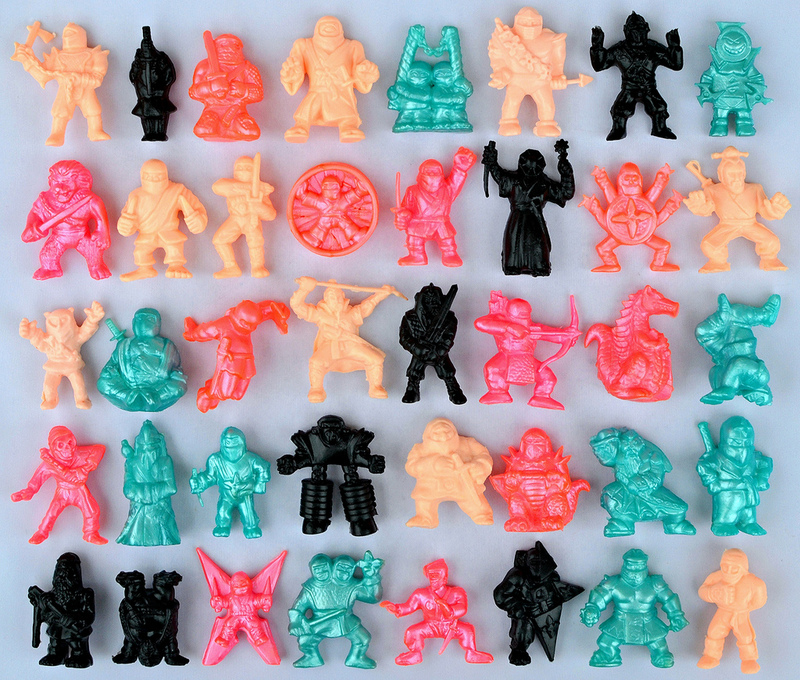 Eight of the ninjas shown, while released as Italian Exogini, are assumed to have never been released as Cosmix even though they're on the checklist. The Cosmix pamphlet used the same artwork as Exogini, so it's understandable how this could have happened. The missing eight are: Indus, Debilus, Terminus, Bonus, Armurus, Ramolus, Coutelus, and Ninjus. Finally, here are complete sculpt sets of Cosmix Series 1 and 2 in all their glory. I have to say, there's something about this mix of colors that just looks awesome. I'm an especially big fan of the metallics. And there you go! 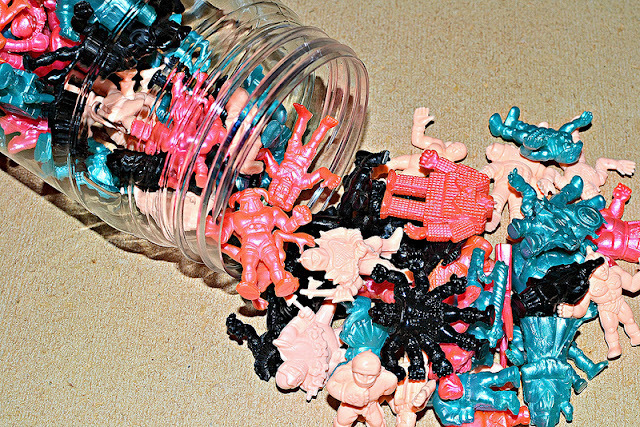 A great European mini figure release from back in the day. Even though it did copy sculpts from previous toy lines, in my opinion the colors make Cosmix worthwhile to collect in its own right. Because these were only released in France, they don't turn up in other parts of the world frequently like similar series such as MUSCLE and Monster in My Pocket do, but there's usually plenty to be found from French sellers on eBay. What do you think of these little guys? I knew nothing about these, but dang, they're awesome! Glad to turn you onto them! I'm french and had a big amount of those. Never saw a translucent one. Haha nice. :) I have all mine displayed in a clear jar on my shelf...they look pretty cool that way.